Sometimes in life, things happen that cannot be explained. I'd like to take this approach when explaining last week's happenings. First, because I really cannot explain it, and secondly, it helps reiterate the point that it was in, in fact, an accident. 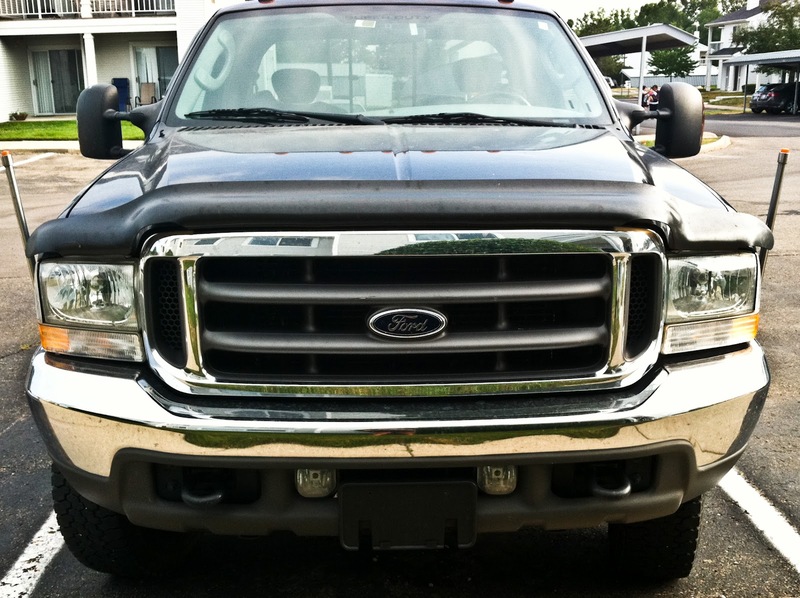 You see, Kyle and I have been going back and forth about selling Big Blue (aka, his F250). I know, Gasp! It's his baby (besides myself and Maizy, of course). The reality is that it is just too large to fit into the hospital parking garages. ANY of the parking garages. The antenna found on the ground demonstrates my point. To solve the problem, he's been driving my car into work everyday....leaving me with Big Blue. Although I love receiving confused looks from people as my blond self acts confidently driving behind the wheel of that honker of a vehicle, it's not the most practical truck around. Ann Arbor has proved to have narrower streets than Charlottesville, with just as many hills. All this equates to a frustrating experience when drive the majority of places in the city. Every tried parallel parking an F250? Yea, me either. Since it's IMPOSSIBLE! Now that you've heard my rant, I'm positive that I've won another point for my side of this ongoing argument conversation. That brings me to this mysterious, for lack of a better word, situation. I was on my merry way to the bank ATM at 8 pm. When I pulled up, I noticed that the dumbo ears of the truck (the mirrors), were very close to the ATM machine. And then I pulled away. I was in shock. Quite frankly, had no idea what just happened. After later putting together the situation , the story unfolded to something of my foot being on the gas, and hitting one poll on one side, to the other poll on the other. I was temped to call Chase Bank to see if they had the security tape from that night, but I was way to embarrassed to admit that I was the one driving in the video they had most likely been laughing at all day long. I did drive by the next day (in our car), to see if I had done any permanent damage (I actually had dreams of a policeman showing up at our door saying I was trying to break into an ATM), but Big Blue only left a lot of paint on a yellow poll. I figured it was a good start for decorations for football season. One insurance claim, $2800 estimate and a lot dwindling pride later, Big Blue is still with us.